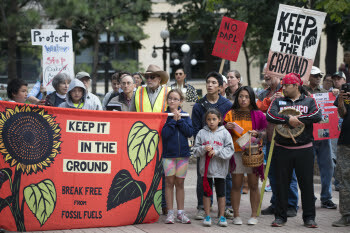 Finally, there is an alliance of a major group — U.S. Indians — and environmentalists who are taking a stand to prevent the furtherance of fossil fuel interests. 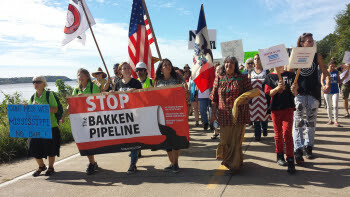 Bill McKibben of 350.org says we must stop now insofar as building more fossil fuel infrastructure, which is what a pipeline represents, if we are to have a hope and a prayer of saving the planet from the effects of global warming. « Why Does San Diego Have Such Bad Air Quality? John. Thank you. A fair and accurate depiction of the situation. My daughter left home in Mexico today to go to Standing Rock. Many others are going too. Why not you to document this stand for the planet and human rights and the violations of the armed men who represent big oil? Everyone must find their own way to stand up and for the many changes this country so sorely needs if it is to join the rest of the planet in facing reality. The pipeline will be built; we surely know that. It’s a reality already. The realities we know now are: politics is controlled by capital, so we get toxins in our water supply; most police departments form a body separate from the laws that regulate cities, states and nations; Big Media is Big Pharma is Big Oil is Big Insurance is Big Banks is Big War is Big Climate Change. We will find a way out of this but it looks like we’re all in for a Big Scuffle. We have to choose, each of us how to fight it. Thank you, to John Lawrence who’s already done his share and is still working effectively. 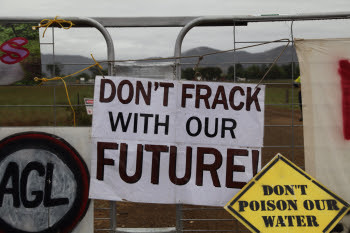 What its the true cost of fracking? Life for the middle class is becoming impossible in Hawaii. Housing and rents are just too high. Teachers, and nurse, come and some leave as there’ no way they can buy a home here, nor save given the rents! H;ow about San Diego? Rents are ridiculously high here too. As of September 2016, average apartment rent within the city of of San Diego, CA is $2123. One bedroom apartments in San Diego rent for $1779 a month on average and two bedroom apartment rents average $2253. The oil interests are well entrenched on capitol hill, and they apparently have Obama’s ear on this one. It makes me wonder: did he (Obama) make some kind of deal with the oil lobby to be silent on this one if they let him shut down Keystone? His silence on the Dakota Access pipeline must have some explanation. We are facing with climate change such an environmental disaster, that all other issues seem muted in comparison. Everyone is still glued to the TV watching the World Series or football and it seem that they are not even aware. They could all be out protesting. Standing Rock is a real expression of the dangers we all are facing. We should all be protesting to save our species. Hi Grace. I feel like you are angry with me because I watched Game 7 last night between the Cubs and the Indians. Despite that escape into the world of entertainment, I am aware and I do care! Protesting all that is wrong will not save our species. Only great ideas put into action will do that. No one argues with a great idea, and they do seem to be gaining traction… but not fast enough! The Standing Rock protests not only express the grave dangers we all face of perpetuating our consumption of fossil-fuels by building infrastructure that will expand their use, this particular episode illustrates to us all once again what we white folks should be thoroughly ashamed of, and that is our history of exploiting the Native Americans, who after all, were here before we were. Like Keystone, the President can shut this pipeline project down also, if he has the political will to do so. Trump wins, he and his congress will most certainly be in favor of oil companies. What now?